Neighborhood Symphony Activity Jumper is rated 4.8 out of 5 by 66. Rated 5 out of 5 by gravy8118 from Grows with baby! We got this for our shower and it's so great! Activities for every stage! I wish we could move it up further than the four slots they give you so he can keep using it even longer! Rated 4 out of 5 by Lisa M from Great jumper! This was one of the best purchases I made. My LO loves this bouncer so much. She never gets bored with it. My only "complaint" is that she pulls on the little trumpet really hard which has bent the green plastic that holds it up. But everything else is spectacular. She loves all the interact with all the toys. Rated 1 out of 5 by Kc73135 from Missing parts We bought this for our grandson. We were very disappointed to discover parts.missing. Rated 4 out of 5 by Keri33 from Lots of fun, one downfall! We bought this for our 5 month old daughter-she already sits up and is ready to go on the move! We absolutely love the product, but I couldn't give it 5 stars for one simple reason that I think can be fixed by the company for further products. The toys on the jumper are very hard and not too mobile. They're stuck in their spots, the parrot doesn't even flip around his stand. The mirror tambourine was my daughters favorite until she jerked a bit and hit herself in the head with it. If it were softer more mobile material, it would have 10 stars!! 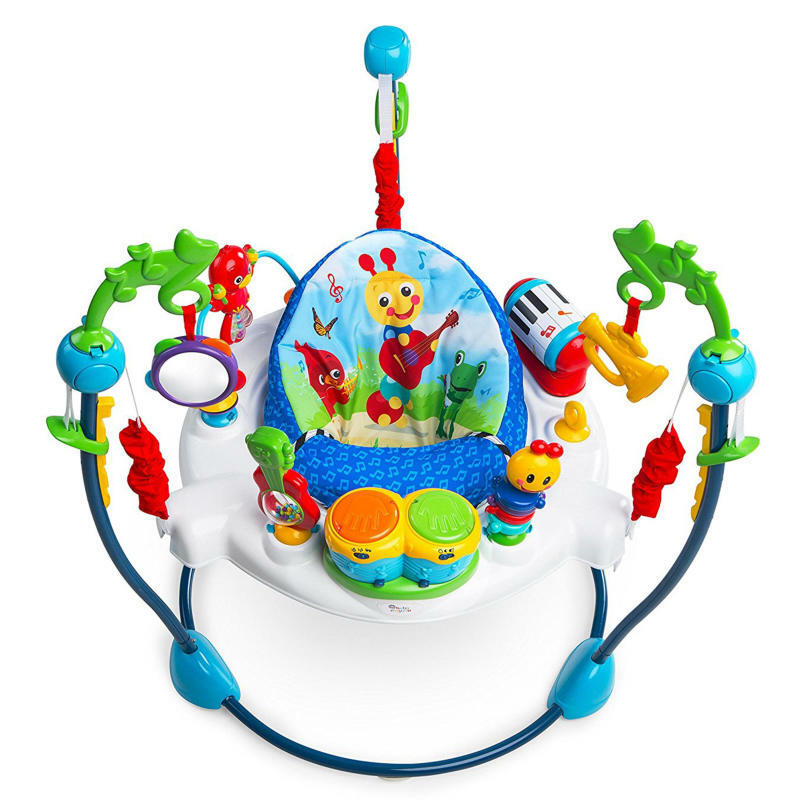 Rated 5 out of 5 by Happymomhappybaby from Love this jumperoo!!! Was very easy to put together, and my son loves it! Rated 4 out of 5 by Janet from Kept Baby Contained & Entertained! began using the Baby Einstein Jumper when our little one was 6.5 months old! It was quick and easy to assemble! The baby enjoyed lots of giggles and loves spinning around and hitting the bongo drums, while batting at the hanging teether. We use the jumper when getting ready for work so that we can keep her contained, yet entertained! The only downfall is that it is a larger item to store, but that is not unique to this particular product.